On July 26, 2015, thousands of runners hit the streets in Paradise to start the 88th annual Tely 10 Mile Road Race, one of Canada’s oldest road races. The race, generally known as the Tely 10, is a 10-mile (16-kilometre) road race that spans McNamara Drive in Paradise to Bannerman Road in St. John’s. It was a chilly morning for July, with temperatures of 12ºC, but that didn’t stop dozens of Eastern Health employees who laced up for the race. At Eastern Health, we focus on both individual and community health. Healthy communities enhance our prospect for individual health, and when individuals are healthy, communities are healthy. 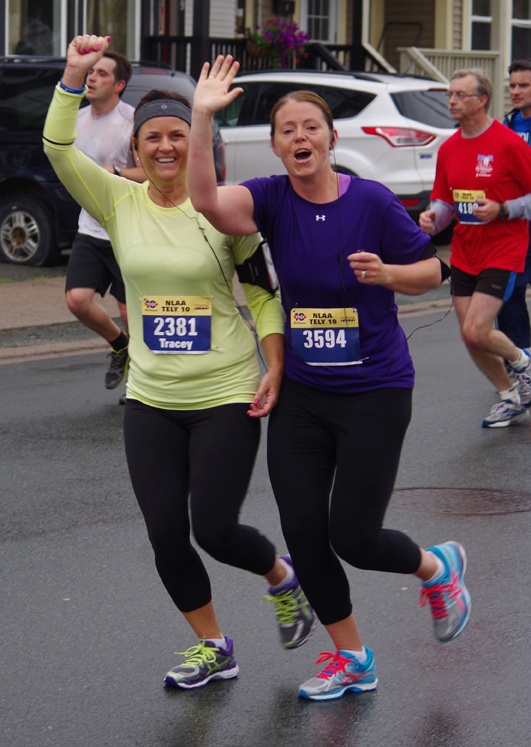 Running the Tely 10 has become an annual activity for many of our employees. This year, well over 100 employees participated! Employees like Jason Guy, a biomedical engineering technologist, with Healthcare Technology and Data Management, who describes it as “a fast and fun race.” This was his fourth year running the Tely 10, and he says he’ll take part as long as he’s able to run. Jason Guy running a fast race. 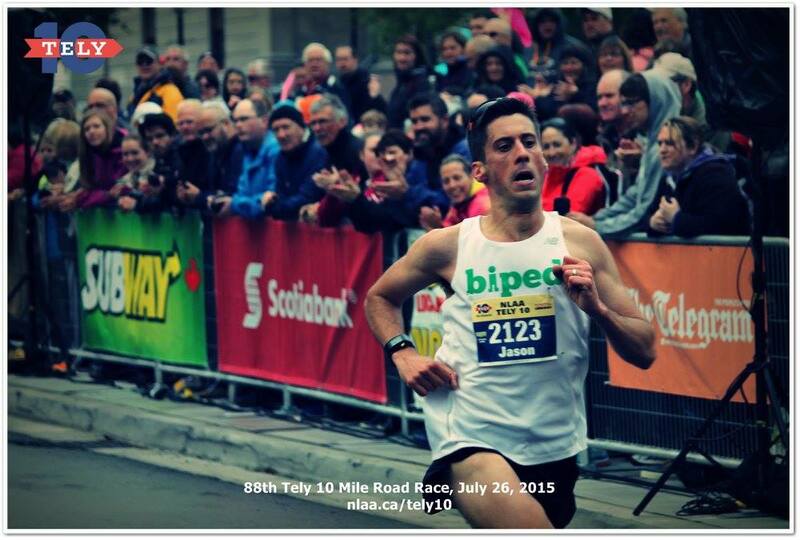 He started training in May, running a half-marathon in Halifax, and then concentrating on preparing for the Tely 10. “Come race day I had a plan and it worked pretty much as I wanted,” Jason says. “I had a painful stitch that caused me to stop at one point, but I was able to jump right back in and run the time I wanted. Jason finished the race with a time of 56:28. Michelle McCarthy Strang finishing the race with a personal best time. There were others, like Michelle McCarthy Strang, who travelled a great distance before the race even began. A clinical physiotherapist at the Burin Peninsula Health Care Centre, the mother of two has been running and training for long distance like the Tely 10 and half marathons for over six years now. 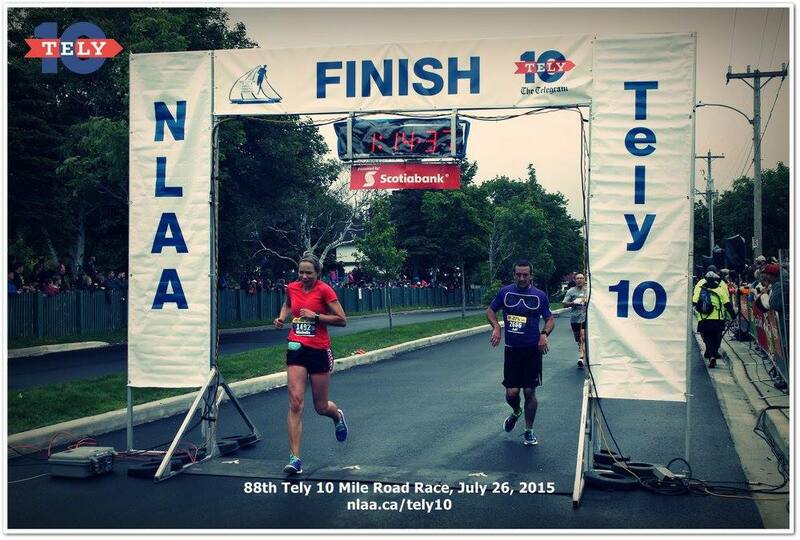 “Participating in the Tely 10 gives me a goal and a focus for training. It’s truly an amazing experience, and the atmosphere and crowds that line the route to offer support is unbelievable,” Michelle says. Joe Dunford (blue and lime shirt) crossing the finish for the eighth time. Joe says running in the Tely 10 sets a good example for his children who come to watch him every year at the Rawlins Cross intersection mark, in downtown St. John’s. 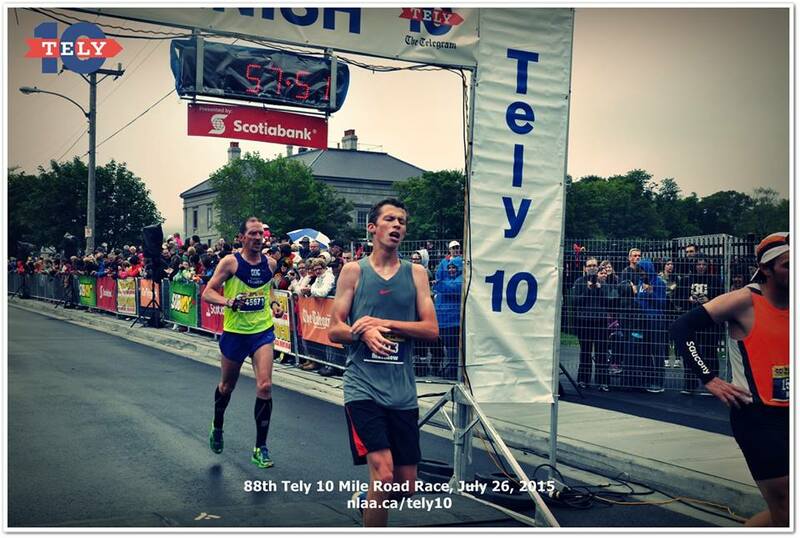 He trains year round and says he uses the Tely 10 as a fitness check, as he heads into the fall road racing season. And then there was Anne Johnston, a clinical occupational therapist, with Children’s and Women’s Health – this year’s female champion with a time of 58:55! Anne Johnston – this year’s female champion. Anne has been a competitive runner for the past 15 years. 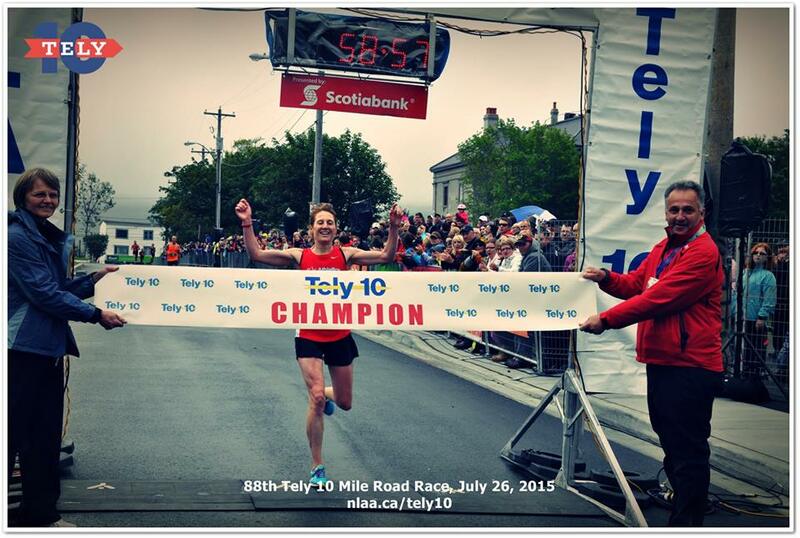 In fact, she won the female championship for the Tely 10 once before, in 2004. Over the past few years, she has not been running due to injuries and other commitments. But this year it all came together for her. “I didn’t really know what to expect the day of the race – and just ran how I felt,” she says modestly. And then there were employees who challenged themselves, in the wake of injuries and the recovery process. But apparently, that’s not the case when you have a great buddy to run with. Tracey and Sherry Goodridge, a registered nurse, work together in the Children’s and Women’s Health program and decided to team up for the race. Having had similar injuries and therapy, they agreed they would stick together, despite being surrounded by over 4,000 runners all the way! Tracey Carter and Sherry Goodridge waving to supportive friends and coworkers. “It was uplifting to see our friends and coworkers cheering for us on the side of the road,” Tracey says. “My legs were starting to feel heavy as we were approaching the 8th mile by St. Clare’s Mercy Hospital. Then we see the CEO of Eastern Health, Dave Diamond. It was an awesome feeling that would take us through the last couple miles of the race. This story was written by Angela Lawrence, Manager of Graphic Design Services with Eastern Health.